I did my PhD at the Museum für Naturkunde in Berlin, Germany, in the Vertebrate Paleontology lab of Professor Johannes Müller. My degree was conferred in 2012 from the University of California, Santa Cruz, where I first started with Barry Sinervo working on side-blotched lizards. 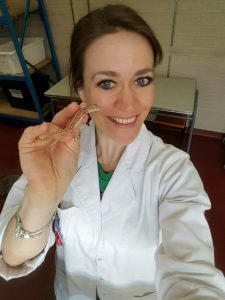 From 2012-2014, I was a DFG-funded Postdoctoral Fellow at the Museum für Naturkunde, and in January 2015, I relocated to the School of BioSciences, University of Melbourne. I’m currently a Research Associate at the Melbourne Museum, where my office is located. In addition to research, I am also active in museum exhibitions, science outreach, and education. I’m Rocío, a passionate herpetologist with over 12 years of field work and fun times in the lab! I explored the paths of ecophysiology, climate change, conservation and habitat use of reptiles. 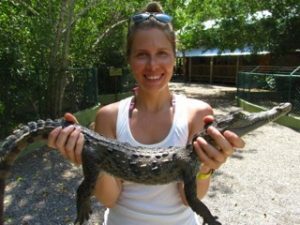 I started my PhD with iguanids back in my home country, Argentina, in the Group of Biodiversity Research at the National Institute of Arid Zones with the tutoring of Dr Ricardo Ojeda on site. As an ecophysiologists, I worked with many colleagues in the cold deserts of Patagonia and Mendoza, where mountains are really high and snowy, challenging geckos, skinks, and little dragons to their limits! 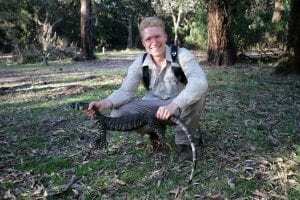 I’ve been working with amazing herpetologists from all over the globe and for more than 6 years I had the pleasure to work side by side with Dr Michael Kearney at the University of Melbourne. My interest in research has no limits but there’s a special spot in my heart for snakes. I spend my days working on energy consumption experiments, metabolic rates, thermal preferences, critical limits, blood sampling, preparing blood smears, preserving specimens, SMD, measuring water evaporative loss rates, husbandry in the lab and data analyses. My latest accomplishment are fossils and CT scanning of hard and soft tissues under the guidance of Dr Christy Hipsley here at Melbourne Museum. She invited me into her lab to explore the world of 3D skeletons and predict what the future will be for the related extant species of those left behind. I will always be passionate about outreach activities and teaching, because “Those who have the privilege to know have the duty to act.” (A. Einstein). I completed my MSc at Humboldt University Berlin in the lab of Johannes Müller in 2017. Currently I´m a joint-PhD student between the Humboldt University Berlin and University of Melbourne. My research aims to examine influences of Pleistocene climatic changes on Australian agamid and varanid lizards using direct fossil evidence from different cave sites in eastern Australia. I´m also interested in macroecological research on reptiles in general and I love catching lizards in the field.